The Houston Rockets’ maniacal pursuit of efficient shots has been copied across the league. Winners of five straight games, the Houston Rockets nudged their record back up to their season-high mark of two games over .500 (16-14) with a blowout win over the Washington Wizards on Wednesday night, during which they set an NBA record by making 26 3-pointers. Despite this hot streak, however, it’s still fair to say that the Rockets have not performed as expected thus far this season. When searching for reasons why that might be the case, the focus has often been on their inability to replicate last season’s switch-happy defense or the early-season injuries and suspensions they had to weather or their general offensive malaise. (If ranking fifth in offensive efficiency can be described as a malaise.) But the root of Houston’s issues may actually just be that the rest of the league is increasingly subscribing to Houston’s core beliefs, which has eaten into the team’s math advantage. To fully understand what that means and how that’s happened, we need to back up a bit. Daryl Morey has been the general manager of the Rockets since 2007, but it wasn’t until the 2012-13 season that the purest form of Morey’s basketball philosophies truly began to shine through on the floor. Coming off three consecutive non-playoff seasons and having just traded for James Harden, the Rockets re-engineered their offense to play not only to their new star’s strengths, but also to The Math. It was during that season that the Rockets began their maniacal pursuit of the most efficient shot on every single possession, turning their collective backs on years of NBA tradition by eschewing the lost art of the mid-range jumper whenever possible in favor of attempts either at the rim or behind the three-point line. It’s easy to see the benefits of that offensive strategy now — six years after the Rockets took it to what then seemed like its logical extreme — but at the time, it was not yet really accepted that this was a healthy way to construct an offense. Not everybody believed in The Math. The Rockets did, however, and they did to a degree that was then unheard of in league history. During that 2012-13 campaign, the Rockets attempted 73.6 percent of their shots from either the restricted area or three-point range, per NBA.com. (For the balance of this piece, we’ll refer to this percentage as a team’s “Moreyball Rate,” in keeping with certain segments of the basketball analytics community.) The next closest team was the Denver Nuggets at 67.4 percent, while the average NBA team had a Moreyball Rate of 57.1 percent. By attempting so many more of their shots from the most efficient areas of the floor than any other team, the Rockets created for themselves a healthy math advantage. Through shot selection alone, they essentially began each game with a small lead that their opponents needed to erase in addition to out-scoring them over the course of 48 minutes in order to win the game. For the next three seasons under Kevin McHale, however, the Rockets’ Moreyball Rate stayed fairly stagnant. They still led the NBA in Moreyball Rate during each of those seasons, but they did so with rates that hovered between 72.6 and 73.8 percent. At the same time, the league average Moreyball Rate crept upward, eating into the Rockets’ math advantage and, by extension, that small de facto lead with which they began every game. This is perhaps best exemplified by scaling their Moreyball Rate against the league average. Fans familiar with baseball statistics like OPS+ will recognize this formula: The NBA average Moreyball Rate is given a score of 100, while a team whose Moreyball Rate is 10 percent better than league average receives a Morey+ score of 110, and a team whose Moreyball Rate is 10 percent worse than league average receives a Morey+ score of 90. So, in a world where the league average Moreyball Rate is 50 percent, a team with a 55 percent Moreyball Rate has a Morey+ of 110, while a team with a 45 percent Moreyball Rate has a Morey+ of 90. Using the same formula, we can calculate that during the 2012-13 season when the Rockets had a Moreyball Rate of 73.6 percent against a league average of 57.1 percent, they had a Morey+ of 129.1, meaning they attempted shots in the restricted area or from three-point territory at a rate 29.1 percent higher than that of the average NBA team. That is a ridiculously high mark. But it was also essentially the high-water mark for the McHale-era Rockets, whose Morey+ plummeted over the next few seasons, though not through any offensive fault of their own. At the same time the Rockets’ math advantage on offense was shrinking, the same thing was happening on the defensive end of the court. During that 2012-13 campaign, the Rockets did an excellent job of limiting their opponents’ attempts from the Moreyball areas of the floor. Slowly but surely, however, they ended up yielding better and better shots, and their opponents’ Moreyball Rate crept upward at an even faster rate than the league average. The decline of the Rockets’ math advantage during that time looks even starker when pitting their offense and defense against each other. At the same time as they were shooting 29.1 percent more often from Moreyball areas than the average team in 2012-13, they were forcing opponents to shoot from those areas 3.2 percent less often than the average squad. Add those two numbers up, and the Rockets had a Moreyball Advantage of 32.2 points during that season. By the time they got to the 2015-16 campaign, however, their Moreyball Advantage had been cut by more than half (to 13.8 points). 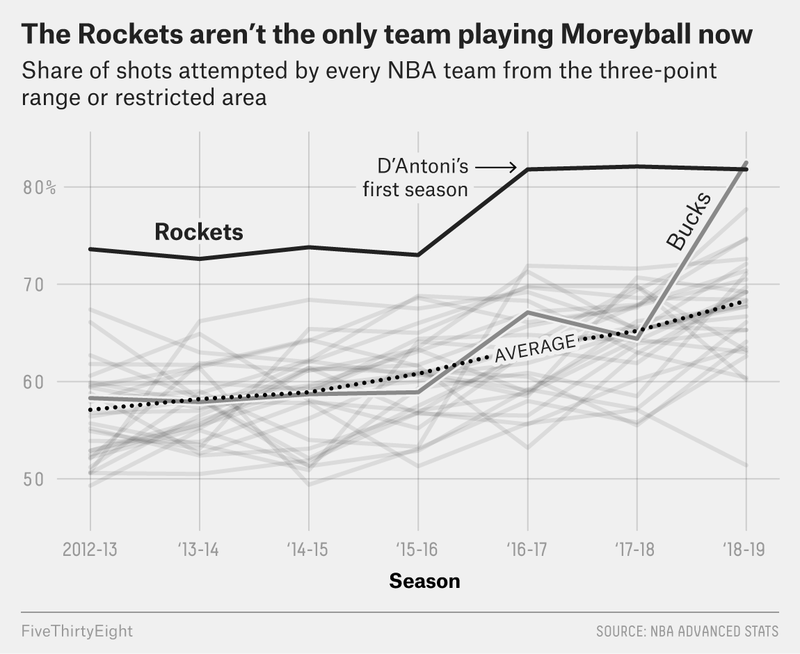 During those four years, the Rockets were the only team to have a Moreyball Rate above 68.8 percent, but the average team still gained steadily gained on them, and their ability to prevent their own opponents from getting to Moreyball areas declined as well. And it was then that Morey decided to hire Mike D’Antoni. Because if the Rockets couldn’t stop the rest of the league from following their lead in following The Math, then the next-best option was for them to take The Math to new heights. In D’Antoni’s first season, the Rockets had a Moreyball Rate of 81.8 percent, blasting the previous league highs they’d set over the prior few seasons. That 81.8 percent figure was, obviously, the highest in the NBA by far, making it the fifth consecutive season during which the Rockets led the league. Crucially, that rate bumped their Morey+ all the way back up to 128.8 — almost all the way back to where it was during that 2012-13 campaign, when the Rockets first began truly orienting their offense around The Math. * A rating where 100 equals the NBA average and every point above or below 100 equals a one percent change (up or down). During that 2016-17 season, though, five other teams exceeded the Moreyball Rate of the 2015-16 Golden State Warriors, who had the highest non-Rockets Moreyball Rate of any team from 2012 through 2016. That incredible jump from one-sixth of the league foreshadowed what has happened since: The league’s Moreyball Rate has been rising far faster than it did during the McHale years, meaning that the Rockets’ math advantage is once again shrinking, through no fault of their own offensive priorities. While the average Moreyball Rate jumped only 3.7 percentage points from 2012 (58.1 percent) through 2016 (60.8 percent), it has rocketed (pun very much intended) all the way up to 68.3 percent in 2019. That’s a jump of 7.5 percentage points in just three seasons, compared with the four it took to erase a smaller advantage for the previous incarnation of the Rockets. And at the same time that the NBA’s average Moreyball Rate has shot through the roof, the Rockets themselves have once again stalled out. They appear to have hit a ceiling in terms of how many of their shots can really be taken from the most efficient areas of the floor. Houston’s sky-high Moreyball Rates during the 2016-17 and 2017-18 seasons helped them to two of the most efficient offensive seasons in NBA history. During that 2016-17 campaign, the Rockets registered the 10th-best offensive efficiency in NBA history, per Basketball-Reference. During the 2017-18 season, they posted the 11th-best offensive efficiency in history. And during both seasons, the Rockets led the NBA in Moreyball Rate by a healthy margin, even while the league as a whole was catching up. This year, however, they don’t even lead the league in Moreyball Rate, marking the first time since the 2011-12 campaign that they’ve fallen out of first place. (They’ve been passed by Mike Budenholzer’s Milwaukee Bucks, who are at 82.6 percent, the highest figure that can be gleaned from the shot location data in NBA.com’s database, which reaches back to the 1996-97 season.) Amazingly, Houston’s Morey+ this season has already dropped below where it was during the 2015-16 season that inspired Morey to bring in D’Antoni in the first place. And even while they’ve cleaned up their defense a bit these past two years, the rate at which leaguewide Moreyball Rates are spiking has left their Moreyball Advantage at the lowest point it’s been in years. It seems unlikely that other NBA teams will simply stop pursuing shots from the Moreyball areas of the floor, so the league average will presumably continue to rise — if not necessarily at quite the rate it has these past few years. And with the Rockets having seemingly maxed out their own Moreyball Rates in the low 80s, it looks like the best way for them to regain the sky-high Moreyball Advantage they had in the early 2010s is by engineering their defense so that opponents simply can’t access the most efficient areas of the floor. But that’s also what every other team in the league has been trying to do to the Rockets for years, and as they’ve been showing us for quite some time now, it’s easier said than done.